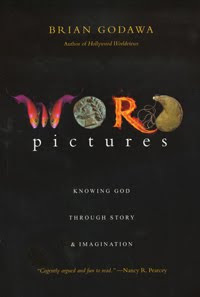 Recently I read Hollywood Worldviews by Brian Godawa (click on the title to see my review) and after I reviewed it, IVP sent me a copy of his latest book, Word Pictures : Knowing God Through Story & Imagination. I have to say that I'm almost afraid of writing a review of it for fear of sounding completely stupid. Why? Because Godawa is clearly a well-thought out individual with fabulous writing skills. I'm quite certain he's an imposing figure in person. I'd rather read his book than try to hold a face-to-face conversation with him. (Yeah, ok, enough with the inferiority complex, Carrie!) While I was reading this book, I was thinking to myself, "Man, Godawa is the type of person who would fit into the Canon Press crowd very well." Reading along he quotes "scholar Peter Leithart" and I knew I had not missed the mark!) Godawa is very pointed, reasoned and someone who I very much enjoy reading from. In Word Pictures Godawa talks about his journey and conviction that we can't be Christians who live only by word and never by images. He would also argue that we absolutely cannot live only by images but that we must live by the word. Now, what does that mean? To simplify his statements, I would say he defines "word" as truth and knowledge and "image" as emotion. In other words, as Christians we should seek a balance between finding truth in creativity and imagination and we should back up our involvement in the arts by learning, knowing and speaking accurate truth. Godawa introduces himself as someone who formerly paid no need to the arts. He found images to produce unwanted emotions within himself and so he dismissed pictures, music, drama as manipulative forces that were at war with thoughtful reasoning. He then goes on to explain how he came to a point of realizing that "indulging" in good music, good food, good company, good artwork was not "caving" into mysticism of some sort. Rather, using images to make solid points for truth is an entirely Biblical practice. He talks about the Old Testament prophets who were "actors", giving people visual images of despair to make points for repentance or to give people a visual image of what was to come. Godawa does a really good job at giving scripture references for all of his main points and lines up his arguments very well. Godawa points out parables, signs and wonders, dreams and visions, poetry, and epic battles that are all a part of the Word of God. He encourages his reader not to get trapped into thinking that life is all about reasoning, nor is it all about imagination. There is a blend that we should seek as Christians, between reason and emotion, to accurately and appropriately appreciate beauty. One of my favorite quotes from this book is, "Beauty is not a waste." It is GOOD to make things beautiful and appealing. Truth CAN be expressed through the arts (all forms really) and we should seek to surround ourselves with art that expresses truth accurately. Godawa's main point in Hollywood Worldviews was, I would say, that art should correctly identify what is truth and what is not. In Word Pictures Godawa is trying to establish that the arts should be included in our lives to more perfectly represent truth to us - NOT in place of reason but in relationship with it. This book was absolutely awesome. It is chalk full of good thoughts and good arguments and is worthy of consideration. Add this to the list of books that you could read about our current culture and how to engage with it. This book is a great addition! Thanks, IVP, for offering us something to chew on. This sounds like an excellent read! I'm going to keep my eyes open for it. Also, I have passed on an award to you, since I really enjoy your blog. Get is here. Sounds stellar to me. I'll look this one up. Thanks for sharing. Pastors use word pictures a lot. I think it helps a person to remember better. I agree it doesn't take the place of Scripture, but it opens our minds to remember it better. Sounds like a great book to me.